If there was even a tiny shred of doubt remaining in your mind as to whether or not The Legal Genealogist is a total law geek, this should put it completely to rest. 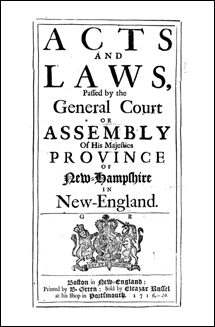 The first-ever published compilation of the laws of New Hampshire. And it’s digitized and free online. Google Books has it here. Wouldn’t you want to know that your ancestor who ran the local tavern in New Hampshire in 1715 was legally required to ensure that there were suitable provisions and lodging for the refreshment and entertainment of strangers and travellers, but had to ensure that the lower classes weren’t to sit “Drinking or Tipling after Ten a Clock at Night” and that he couldn’t “suffer any person to Drink to Drunkenness or Excess nor suffer any person as his or her Guest, to be and remain … on the Lords Day (other than Strangers, Travellers or such as come thither for necessary refreshment)”5 — whatever that meant! These early laws so impacted our early ancestors’ lives… and it is just flat out neat to be able to sit and read them. This is wonderful. 1715 is the year my first Wilkinson ancestor arrived from London to marry Elizabeth Caverly in Portsmouth, New Hampshire. And to think I was just sitting in your lecture, and this was already in my blog reader…. Now THAT is a case of perfect timing! Glad it worked out, Heather! This is great Judy. My husband’s Hall ancestors were, along with others, first to settle in Keene, NH. Love these early laws. Thanks for sharing. The old laws are just so much fun! The state motto [I am assuming, perhaps not] of New Hampshire as seen on their vehicle license plates these days is “Live Free or Die”. A far cry from those old laws! In some cases, the law early on would have meant “live free AND die” rather than OR! Taking the Lord’s name in vain – paraphrased here – shall be punished by six months in prison, the pillory, whipping, “boaring through the tongue with a red hot iron” or hanging. Provided that no more than TWO of the above be inflicted for one offense. OUCH!! Assuming I’m reading it right (pg 121) – they used just as many unnecessary words in those days as the legal profession does now!! Makes you glad you live today and not then, doesn’t it? I wasn’t able to make it to the NEHGS convention (next time! ), but I did just find out that at least one of my many New England lines were probably in NH during the 1700s! So nice timing. Besides, these things are just plain interesting reading. Sure gives great clues about the values and expectations folks lived under. And it sure wouldn’t surprise me any to learn that one of my ancestors was guilty of (OMG!) traveling on Sunday or tippling after ten, or heaven for-fend, actually harming an orchard! Those punishments are indeed pretty draconian and probably account for the intransigent independence and stubbornness (not to speak of reluctant church attendance) of folks in these hyar parts. Wolves in New Hampshire in 1715? How sadly things have changed. This is so interesting. I do not yet know of any ancestors in New Hampshire, but when I do, this will be a gem.